So today it happened. Good Folks Coffee was brewing. The flavored creamer that I love was empty. We were sitting out on the back deck with the TV watching the North Carolina Tarheels play basketball. The brisk cold air and basketball called for a great cup of coffee. I love coffee. But I can’t drink the coffee black. I have to have my creamer. I remembered I had a few items in my cabinet that would make a good coffee creamer. 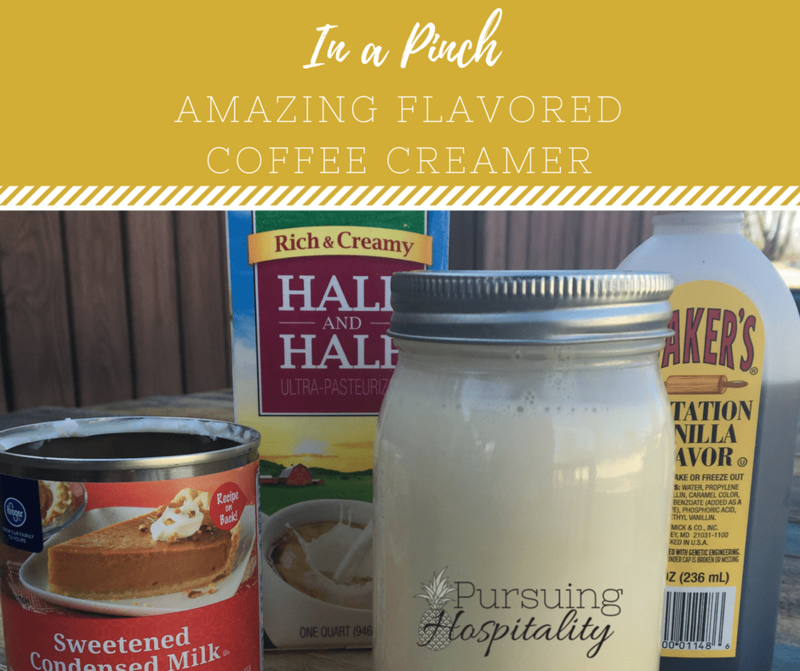 My DIY Flavored Coffee Creamer recipe. I don’t know why I just don’t keep this all the time. Every time I make this coffee creamer recipe, I am in a pinch and need some, and then I always say, I love this recipe. 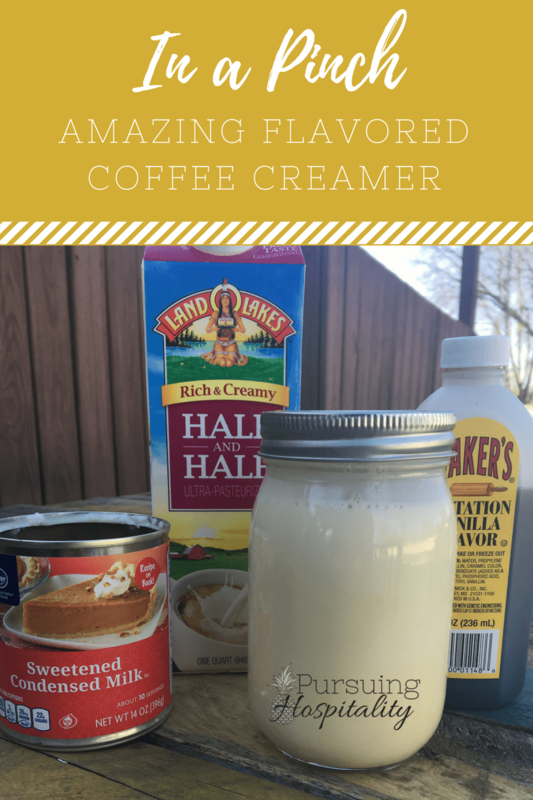 It is probably one of my favorite flavors of coffee creamer, and it is so easy to make. Plus almost every kitchen should have the ingredients on hand. I remember when I put these ingredients together and praying that it would taste good. My husband was having a leadership meeting at our house, and I was having dessert and coffee for the group to enjoy. Brownies, Lemon cupcakes, Momma’s Poundcake were displayed so pretty, and the best smelling coffee was brewing. I went to the refrigerator, and I didn’t have any creamer. Panic was flooding my body. I didn’t have time to run to the store and didn’t want to ask Gregg to go either. So off to the pantry I went to see what I could do. I remembered reading a recipe for Perfect Iced Coffee from Pioneer Woman and took some of her ingredients and started mixing my concoction. I had more compliments for the coffee creamer that night, and I have to admit, I loved it too! So do you want to know how to make this liquid too? It is so simple. Anyone can make it, and everyone will love it. 2 tbsp of Vanilla flavoring. You can use any flavoring that you like, but I have found the majority of the coffee drinkers loves vanilla. Also, you can adjust the amount based on of your liking. Half and Half, Almond Milk, Milk…. any milk product you like. Pour the Sweetened Condensed Milk into the pint jar. Add your flavoring to the pint jar. Mix the Condensed milk and flavoring. Fill the jar with your milk choice. You will need to shake each time you use your DIY Flavored Coffee Creamer. I am a sweet-a-holic so if this is too sweet for you, put it in a larger jar and just add more milk to the recipe. Adding more milk will dilute the Sweetened condensed milk and also make it go farther. You will need to add more flavoring as well if you do this. Let me know how you like this recipe. I told myself after today; I am just going to keep this in my refrigerator all the time. At least it is made from ingredients that we usually have. Enjoy your DIY Flavored Coffee Creamer.